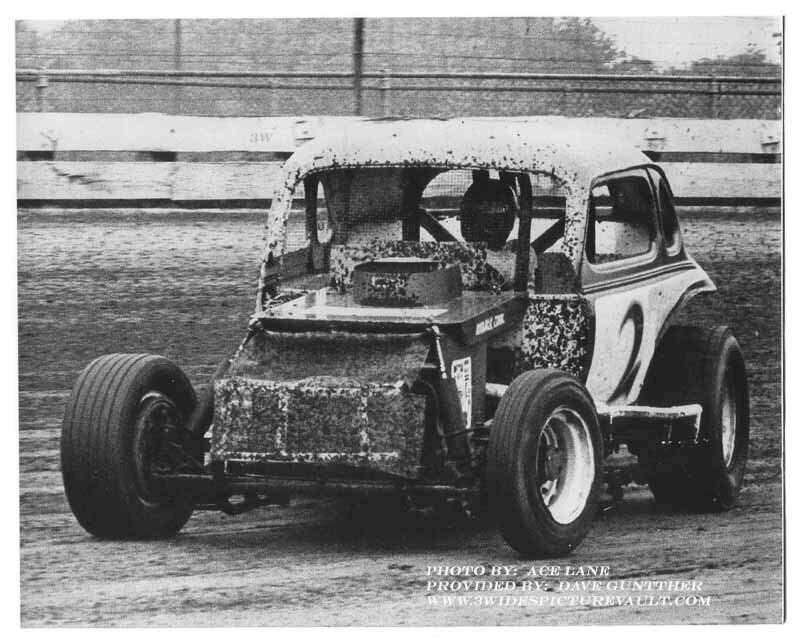 12/21/16: Sad news has reached us that former 1981 Wall Stadium Modern Stock Champion Lee Taylor passed away on 12/21. Fellow Wall Stadium racer Kevin Eyres adds, "Lee was one of the good guys who enjoyed a good time in racing, always there to help." I was very fortunate to meet Lee about 10 years ago while he was teaching computers at the Ocean County Vocational Technical School in Jackson NJ. Lee was introduced to me by mutual good friend Buck Hurley. Once Lee heard about our website, he very generously offered many black and white images to us here at the Vault from his father Charles Taylor's collection. Charles was the main photographer at Wall Stadium during the 60's, and because of Lee, many of those images can be found here in the 60's Section, as well as in the GSVSCC Section. Our condolences go out to the friends and Family of Lee Taylor. Tuesday December 27th, 2-4 and 7-9 PM - Committal will be private. 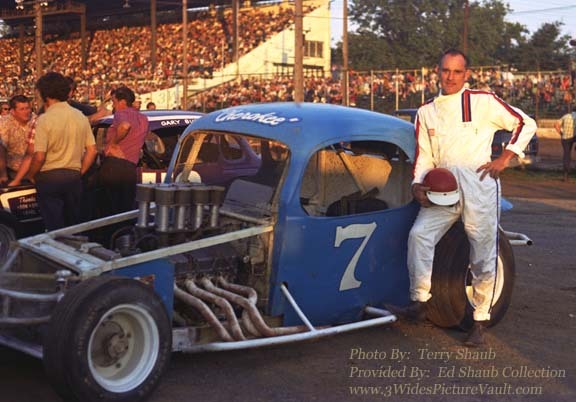 12/13/16 - Sad news has reached on the passing of Jim Wismer, who many will remember driving his light blue #7A at area speedways. I remember Jim being one of those "up on the wheel" drivers, who had a way of being up near the front when the checkered flag waved. 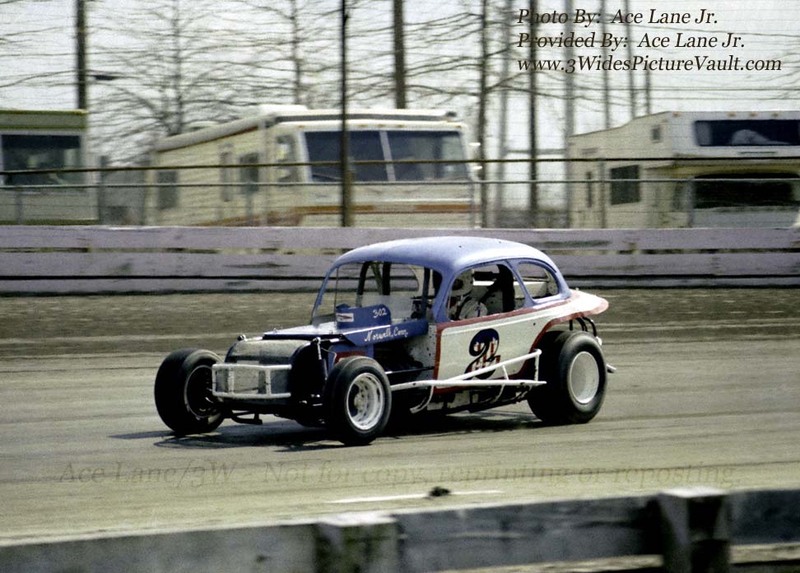 Racing historian Rick Shive adds, Long time sportsman driver Jim Wismer, Sr has passed away after a long illness. 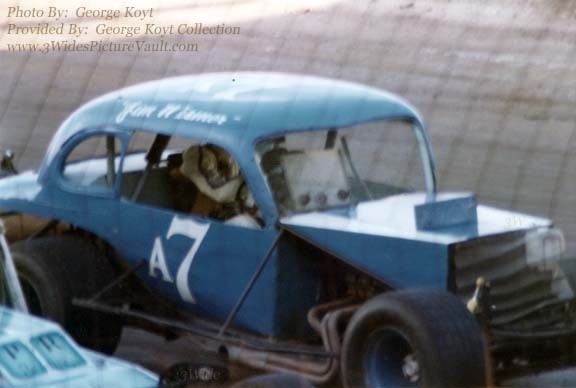 Jim was a frequent feature winner at the Harmony Speedway (with 3 consecutive championships), Flemington and Nazareth Speedways. Jim always got the job done in homebuilt equipment, a great mechanic. 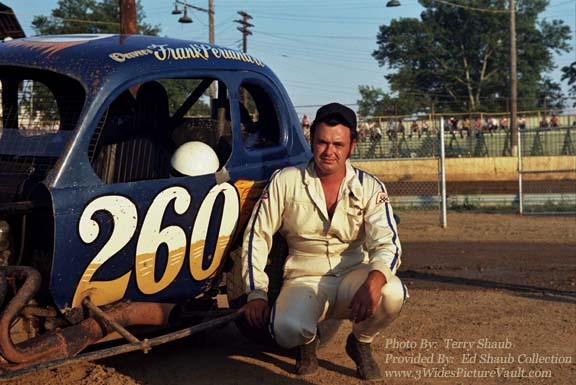 His son Jimmy Jr. carried on the name, winning many late model features at Flemington in the asphalt era, as well as a few other tracks. Our sympathy goes out to his family." 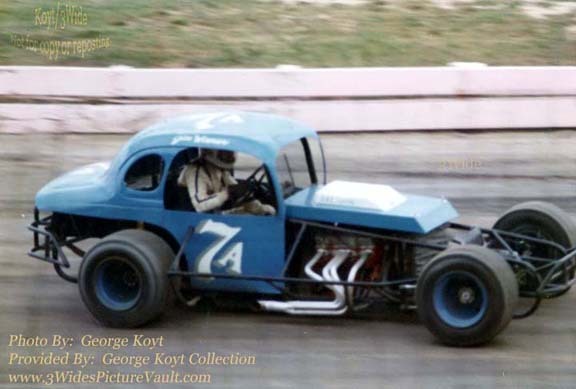 We remember Jim, driving and winning in, in that blue #7A. Our sincere condolences to the family of Jim Wismer. Memorial contributions may be made to Doylestown Hospice 595 W. State Street Doylestown PA 18901. 12/7/16: Sad news has reached us on the passing of modified racer Ron Stashek. 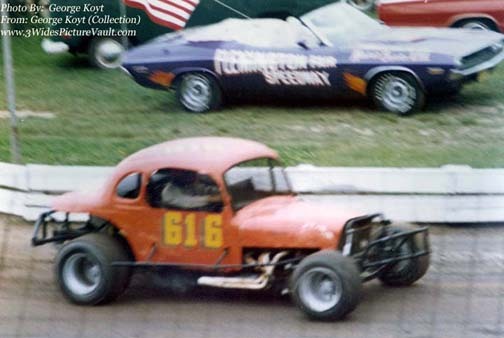 Ron was a steady racer and feature winner at East Windsor and Flemington Speedways in his self owned, usually orange... and "always" #616 racers. 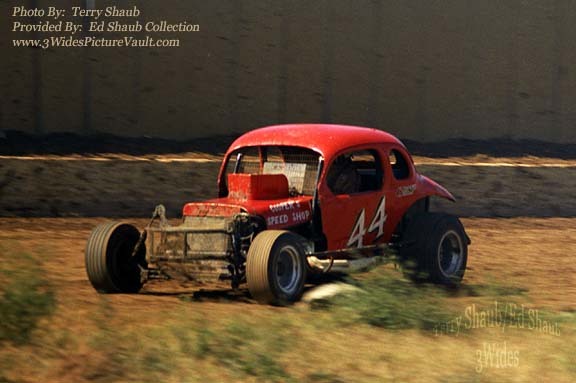 Ron also turned the driving chores to others, including Mike Grbac, Billy Pauch and Fred DeGroot. We're sorry to hear of Ron's passing, and we offer our condolences to the friends and family of Ron Stashek. 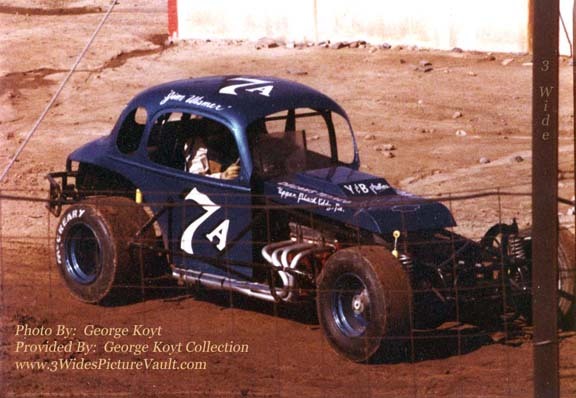 11/9/16: Sad news has reached us of the passing of 60's & 70's racer Fred DeGroot. 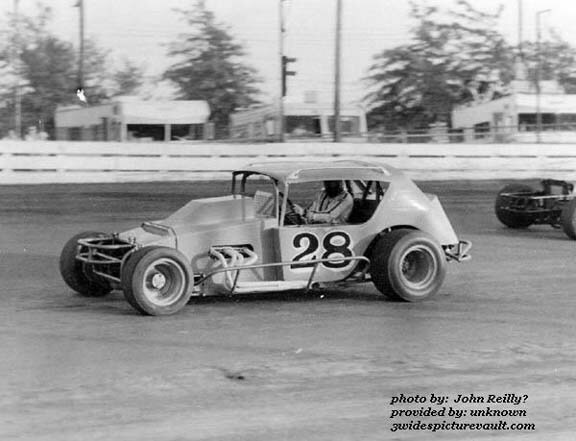 Over the years, Fred drove the Periandri #260, the Meals #44, The Billy Flagg owned #28, the Reebe owned #45 and his own #305 racers. 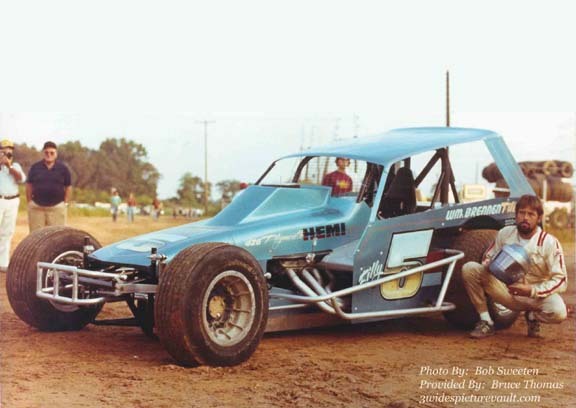 My personal memories include an early Falcon bodied racer that Fred drove at East Windsor in the late 60's that I thought was so cool looking, that I made an H.O. 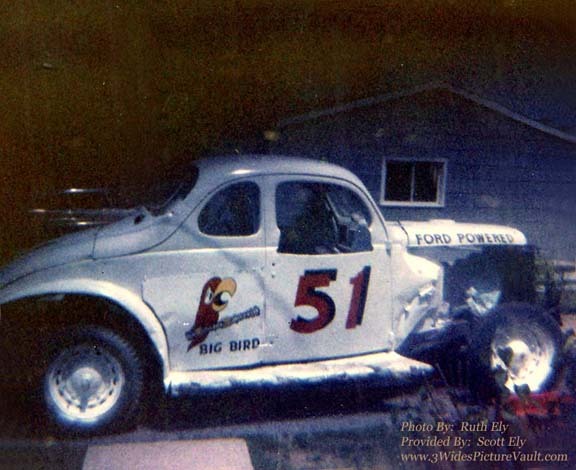 car that looked like it, and referred to it for years as "The "DeGroot Falcon." We'll remember Fred here in the pages of The Vault, and offer our sincere condolences to the friends and family of Fred DeGroot. 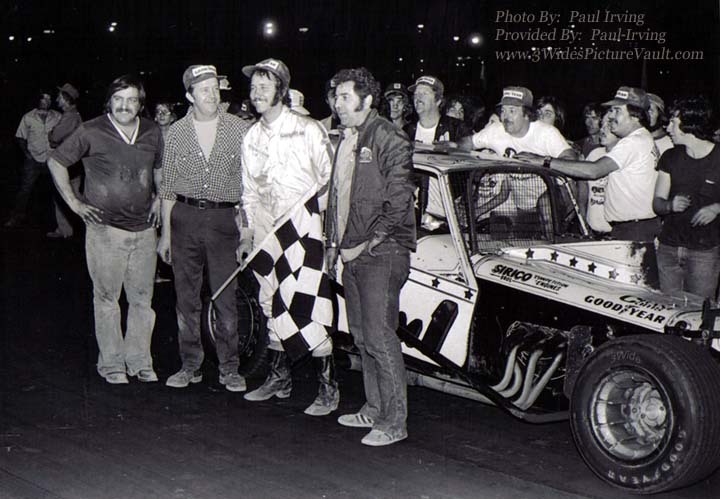 Car owner Rich Marinelli (left), crew chief Whip Mulligan, driver Gary Balough and engine builder Frank Sirico in OCFS victory lane. 9/7/16: Sad news has reached us of the passing of car owner Rich Marinelli. Rich was respected by all who knew him, and by those who raced against his cars. 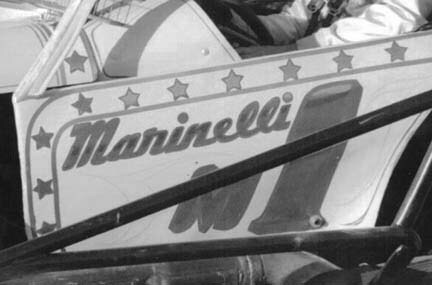 We'll always remember the beautiful modifieds that wore the Marinelli "M1." Our condolences go out to the friends and family of Rich Marinelli. Family and friends may call on Monday, September 12th, from 2 to 4 and from 6 to 8 p.m. at the Fiore Funeral Home, www.fiorefuneralhome.com , 230 Market Street, Bangor PA. Services and burial will be at the convenience of the family. In lieu of flowers, memorial donations should be offered in Richard's name to the charity of one's choice. 8/9/16: Sad news has reached us that Late Model driver "Cowboy" George Yawger has passed away. 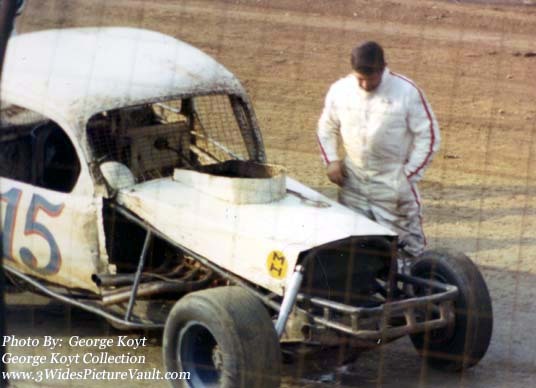 George was one of the "team drivers" on the Circle 2 pictured above, and was a feature winner at the East Windsor Speedway and at the Flemington Fairgrounds. "George also drove Kim Jamison's #99 LM and Stan Janiszewski's #76A Falcon sportsman car," said #Circle 2 fellow owner/driver John McCaughey. "George, Mark Galbraith and myself all shared ownership and driving duties of the #Circle 2 Late Model at Flemington, EWS and OCFS. The cool thing about it besides being so much fun to race with 2 great guys was that we were all able to win races with the car and by racing 3 times a week, we were all able to drive pretty often. In fact, George won the 1980 opener at EWS over Gary Raymond, then followed up by winning the Flemington opener the following week, only to be DQ'ed for being underweight." Services will be held at the Coughlin Funeral Home, 15 Academy St, Califon NJ on August 27th, with calling hours from 11am-1pm. Our condolences to the friends and family of "Cowboy" George Yawger. 8/7/2016 - Very sad news has reached us that open wheel racer Bryan Clauson died Sunday from injuries suffered in a violent crash during Saturday night’s Belleville Nationals feature at the Belleville High Banks in Kansas. Bryan carried the dreams of local short track racers from all across the country, as he made it to the big stage at Indy..., for them, and for us. How fortunate we all were to have seen Bryan race and win locally, during the traveling open wheel shows over the past few years. He was exceptional. Our sincere condolences go out to the friends and family of Bryan Clauson. 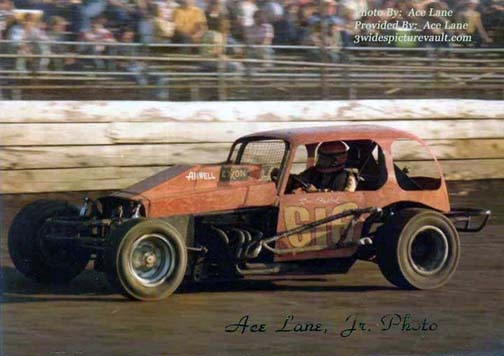 Ace Lane Jr photo - Provided by Ace Lane Jr.
7/31/16: Sad news has reached us on the passing of racer Steve Makocy. 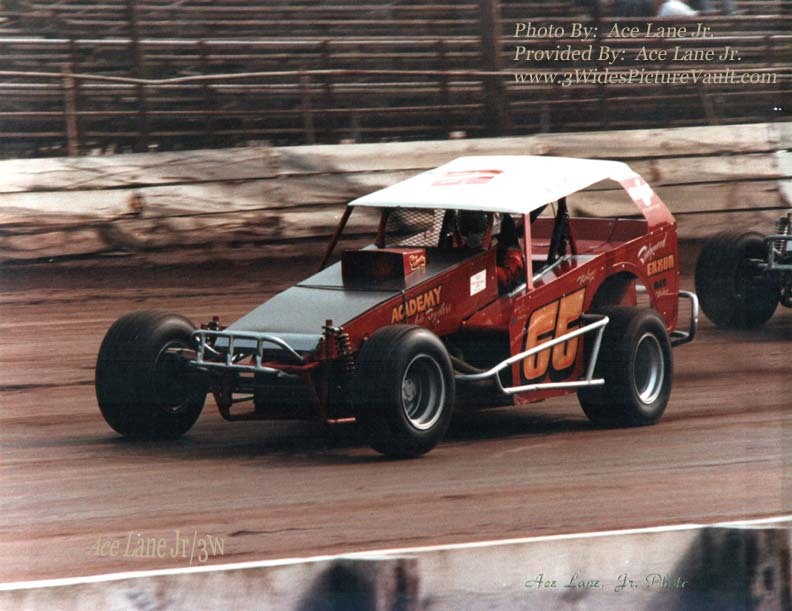 Steve raced at Middletown and East Windsor in the 80's, as well as on the mile at Syracuse, including a win in the 320 on the big track. Our condolences go out to the Family and friends of Steve Makocy. 5/10/16 Word has reached us on the passing of modified driver Dutch Hoag. Although not a local runner at the short tracks of NJ, Dutch made his presence known by being the man to beat at the big shows. 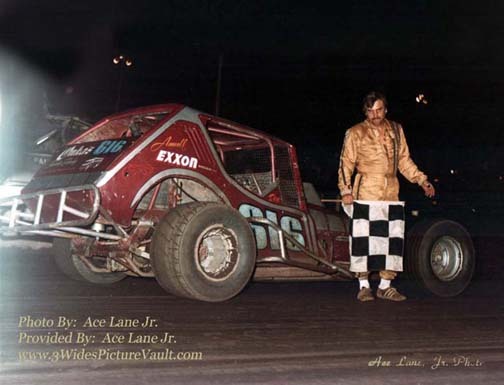 And the bigger the show... the higher the level of competition, Dutch rose to the top, including being a multi-time winner at the Langhorne Speedway. Our condolences to the friends and family of Dutch Hoag. 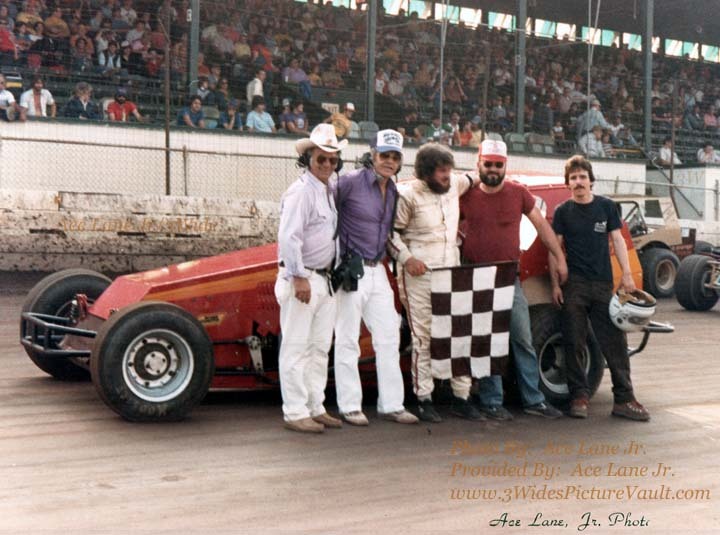 Guy Howie and crew are joined by Harry Dee and Al Tasnady in victory lane at Flemington Speedway - Ace Lane Jr photo. 5/10/16 Sad news has reached us of the passing of Guy Howie. Many will remember Guy wheeling his red #19 to the 1982 Rookie Champion at Flemington Speedway. Guy would continue driving, and would go on to field a sprint car team for many years. Those that knew Guy all have a few stories, and we hope it's those memories that help the friends and family get through this difficult time. Our condolences go out the Howie Family. 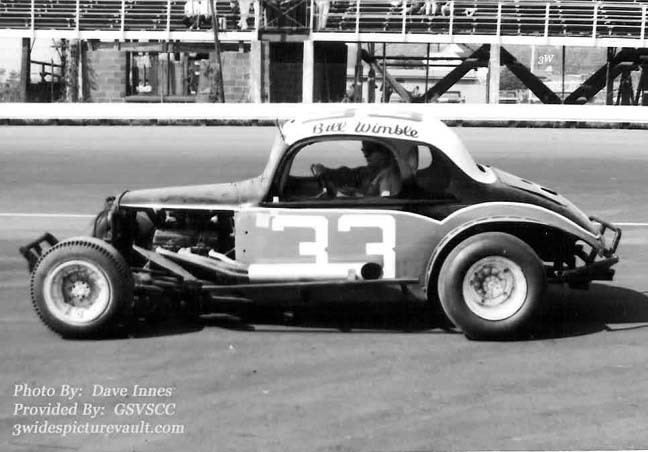 Sad news has reached us of the passing of 50's - 60's racing great Bill Wimble. 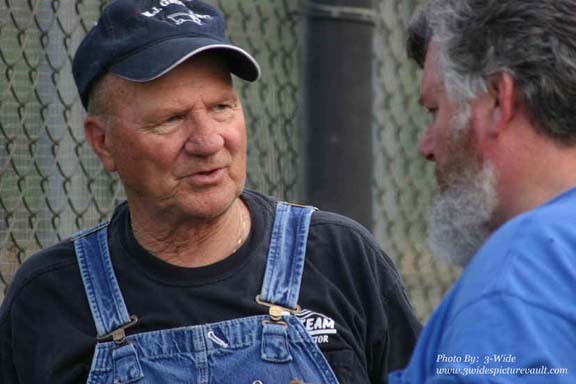 Bill made many fans and friends as a driver, and also after his driving career as a shining example of what's best about the sport of stock car racing. Friend of Bill for many years Steve Pados added, "Our dear friend Bill Wimble passed away on Sunday. I know he touched many of our lives as he was truly an extraordinary gentleman. To those who would like to send a sympathy card I am including his wife Nancy's address." Our condolences go out to the fans and friends of Bill Wimble. 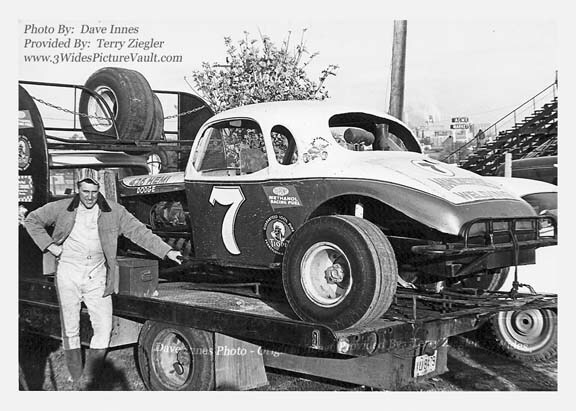 Very sad news has reached us of the passing of Sportsman racer Dave Gunther. I watched Dave run the #2 at Flemington in the 70's, and then got to meet him at the NOTARC events at Flemington in 2003. Struck up a conversation and found that he visited our site often. Some of the earliest photos provided for the Vault were from Dave's collection. He was a racer, and he was also a huge fan of the sport. Dave loved the square. 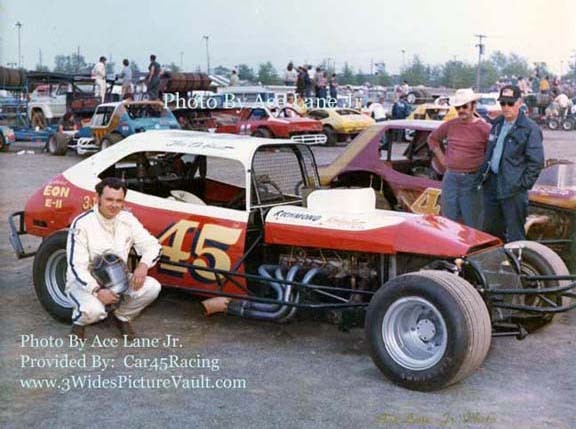 He would make the long tow all the way down from Connecticut, just to race at Flemington in the Sportsman division, each Saturday night back in the mid 70's at Flemington. My sincere condolences go out to the Family and the friends of Dave Gunther. We will miss our friend. March 15th, 2016 - We are very sad to learn of the passing of Al Whitehouse. A long time Ford campaigner, first as a driver, and then later as a car owner, with drivers Lee McBride and Bob McCollough. Al's cars were always up front. 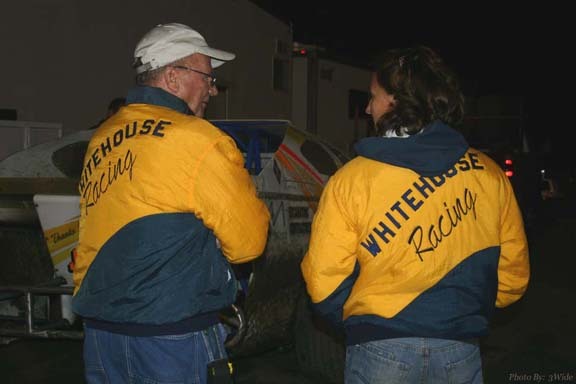 Over the past few decades, Al racing carried through to the entire "Whitehouse Family." 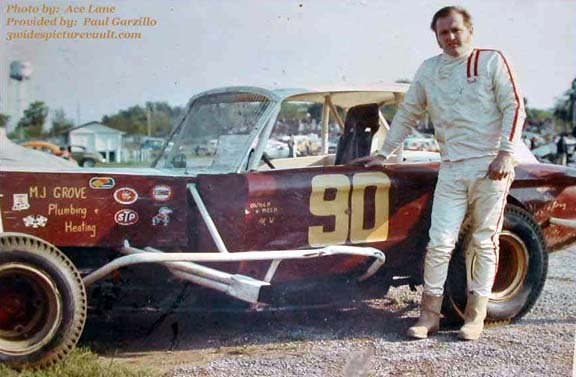 I can remember Bill Singer's voice back in the 70's at East Windsor announcing the "#90 modified owned by Lynn Whitehouse" (wife of Al). In the 90's, Al's daughter Carol became top runner and feature event winner in the Late Model Division at East Windsor Speedway. 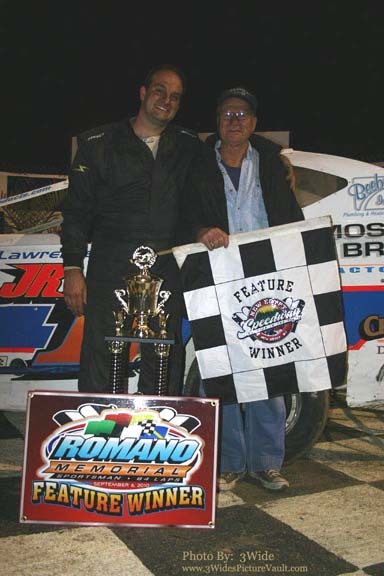 In the 2000's, Al's son-in-law Rocco Infante became a top driver in both the sportsman and later, the modified divisions. 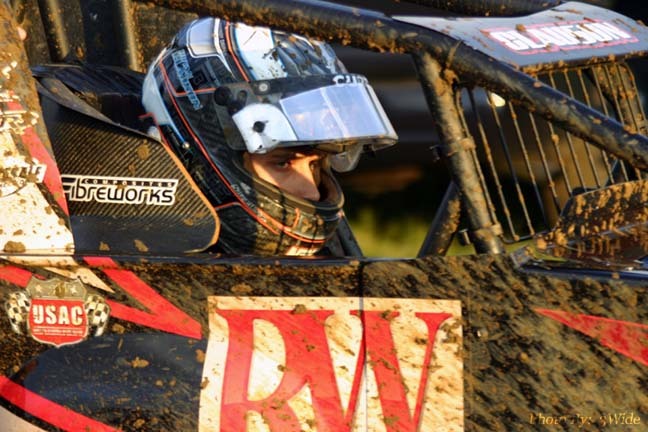 Most recently, Al's grandson DJ Ruppert has also become a strong addition to the 358 Modified Division at New Egypt Speedway. Many of the cars driven over the years carried the familiar #90, a long standing Whitehouse tradition. 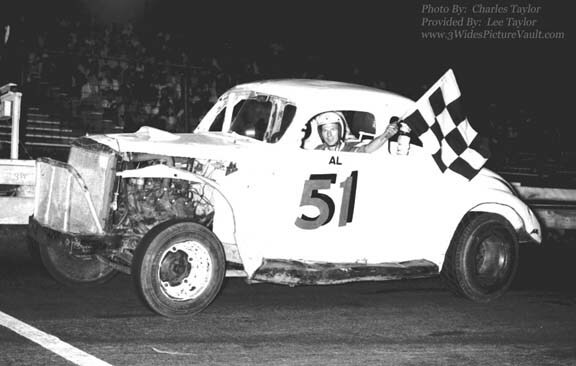 Al drove the #51 in the early years and is seen in victory lane at Wall (top right). 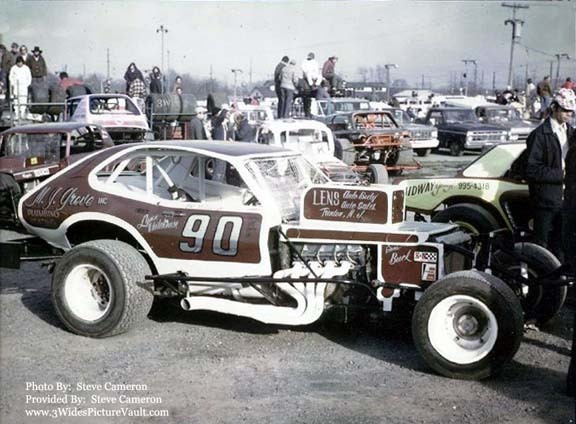 Al would then drive the #90 coupe (above left), and would have driver Bob McCollough drive his sportsman (above center, and also the #90 modified "owned by Lynn Whitehouse" (above right). For the past decade or so, Al could be found in the pits at New Egypt (left). That's Al and his daughter Carol (right photo). Al joins son-in-law Rocco Infante in victory lane in this 2010 photo. 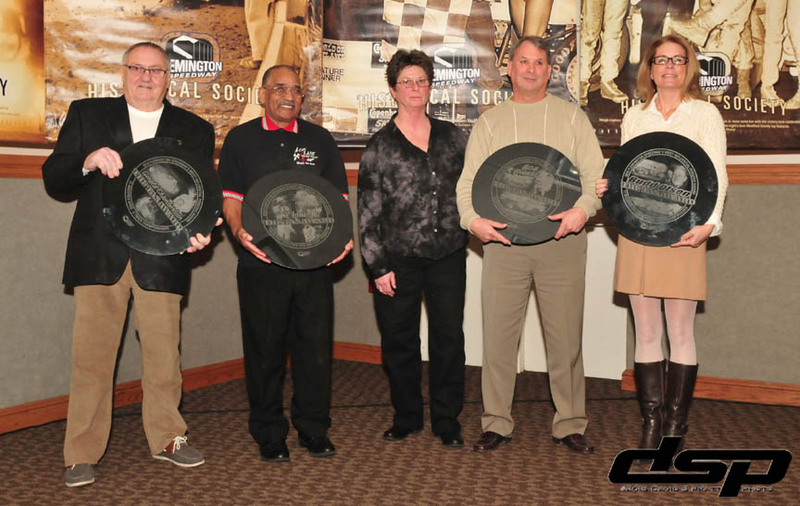 Along with Al's accomplishments on the track and in the pits, we were fortunate to be at the 2015 Garden State Vintage Stock Car Club Banquet to see Al become inducted into the GSVSCC Hall of Fame in the Car Owner category. It is an accomplishment that this great racing family can be very proud of. Whenever I'd see Al in the pits at New Egypt, I'd point out that my shirt said "Ford Racing" on the pocket... and he'd give me a big smile. Like so many others in the racing community, I'll miss saying hello to him and seeing that smile. Our condolences go out to the friends and family of Al Whitehouse. Family and friends may call on Sunday, March 20, 2016, from 3:30 p.m. to 6:30 p.m. and Monday, March 21, 2016 from 9:30 a.m. 10:30 a.m. at the Saul Colonial Home, 3795 Nottingham Way, Hamilton Square NJ 08690. March 7th, 2016 - Sad news has reached us of the passing of Roy Pauch. 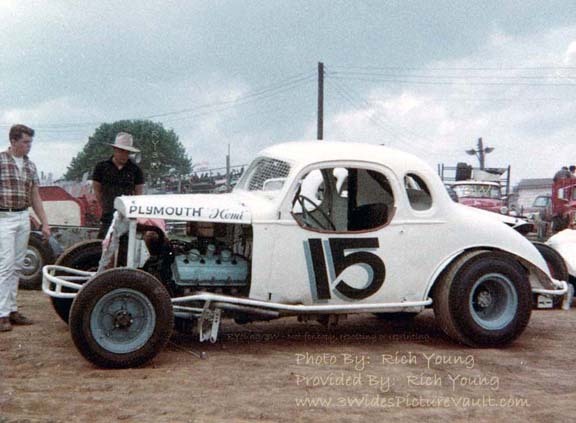 Roy, with his white #15 modified coupe racers, was known as one tough racer in the late 60's and early 70's. 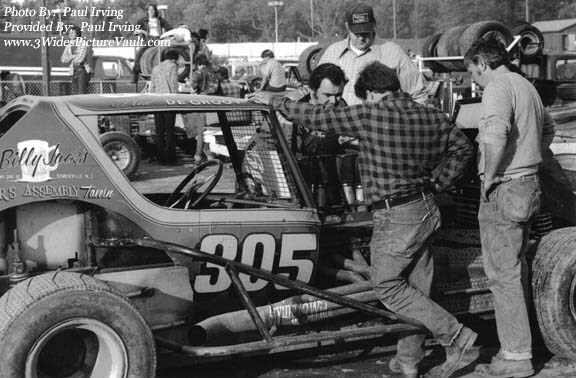 Once his sons Billy and Timmy were ready to start their racing careers, Roy stepped out of the driver's seat and into the role of crew chief. That knowledge would take both Billy and Timmy to victory early in their careers. 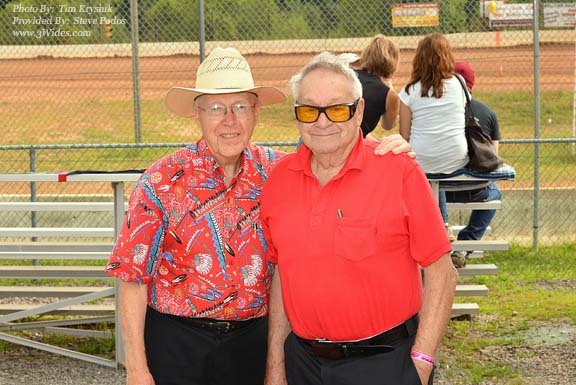 In more recent years, Roy's knowledge was again put to good use as grandson Billy Pauch Jr. would start his racing career and in a very short time, would become one of the northeast's top racers. 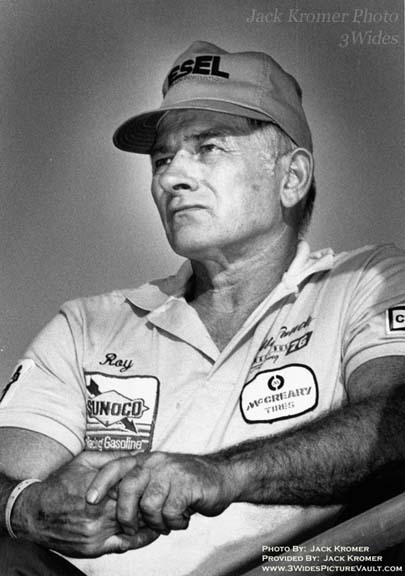 Roy had that clever "farmer's knowledge" possessed by the those who learned early to live each day understanding how to fix things... how to make them work... and to then use the time while they were working to think of a way to make them work even better... 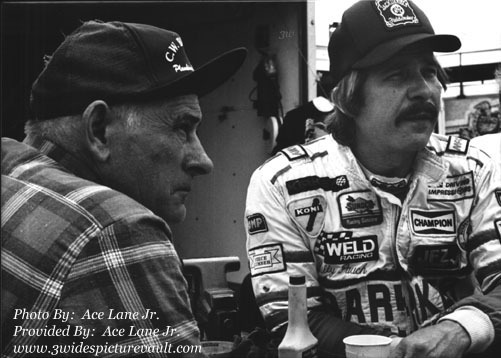 It was that mechanical understanding of things that would prove invaluable in making his coupe bodied racers competitive, and would later be a driving force in keeping the racecars of his son's and grandson up front. Our condolences go out to the the Pauch Family. 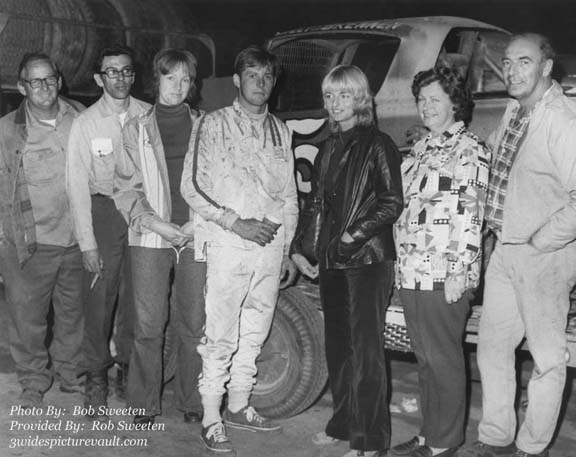 Top left by Bob Sweeten/Rick Sweeten, top right photo Wayne Bechtel/Frank Miler, bottom left Ace Lane Jr, bottom right Bob Sweeten/Bruce Thomas. 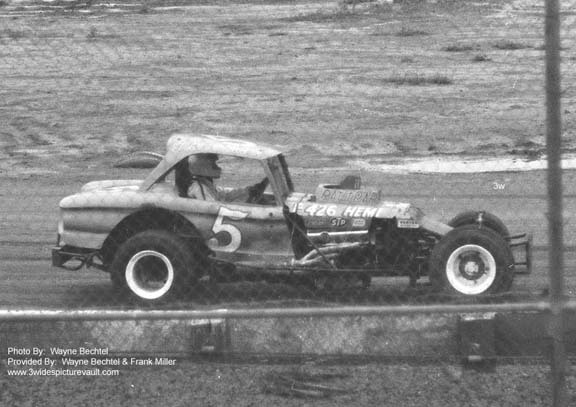 March 3rd, 2016 - We are sad to learn of the passing of racer Billy Brennen. 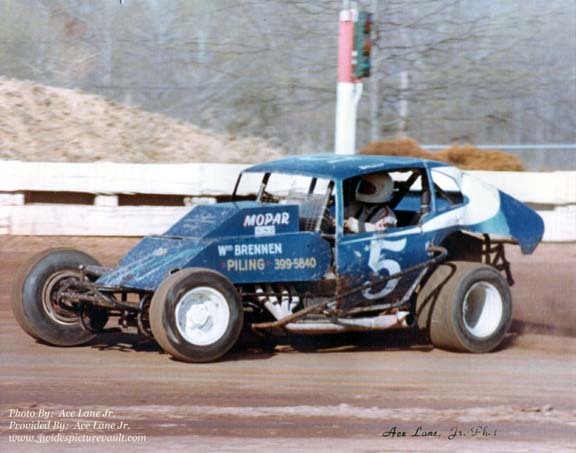 Vault visitors will always remember the blue Mopar powered #5 racers that Billy piloted over the years at Bridgeport, Flemington, East Windsor and more. Our condolences go out to the Brennen Family. 2016 Flemington Speedway Historical Society "Tas Awards"
Accepting awards at the Jan 16th even shown above are driver Gerald Chamberlain, photographer Ace Lane Jr, Brenda & Bobby Pickel accepting for their father Bobby Pickell, and Janet McLaughlin accepting the award for the family of Budd Olsen. Our condolences to the friends and family of Leon Manchester. 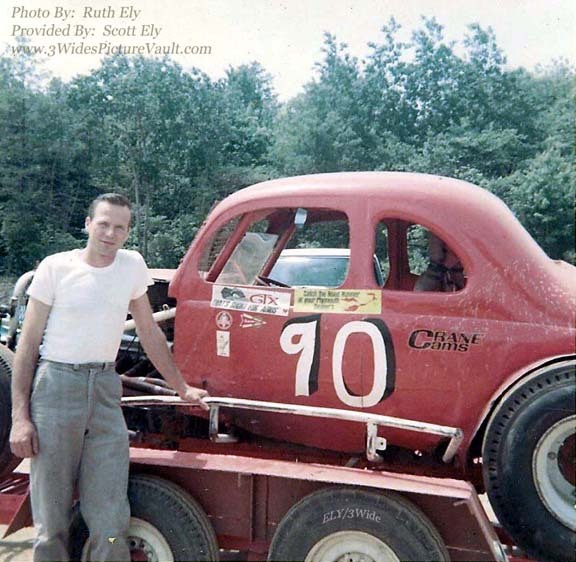 Royce “Dizzy Dean” Renfro was a favorite racer at Reading Fairgrounds throughout the 60's and 70's. 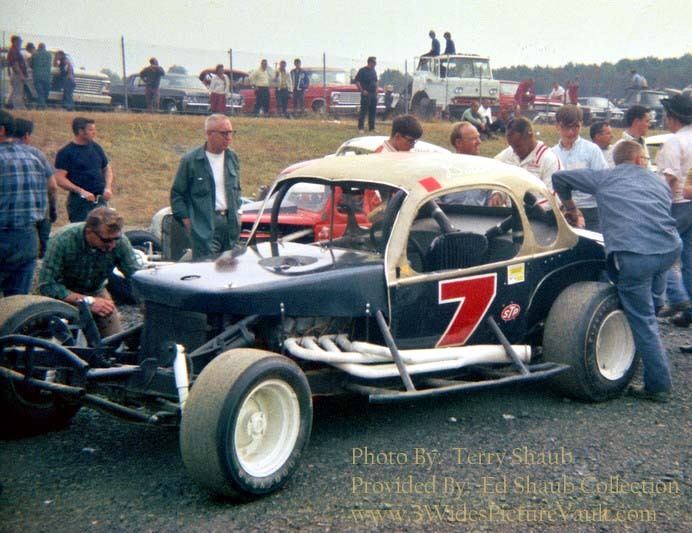 "Diz" is pictured above next to the Herb Vail #7 coupe, one of many different modifieds that he piloted throughout his career. More information will be posted on the EMMR website at: http://www.emmr.org/ . Our condolences to the family, friends and many fans of Dizzy Dean.